A few people have asked me how they become followers of my blog. It's pretty simple. Click on 'Join this Site' on the right hand side and then 'follow this blog'. It may ask you to create a google account, but all you need to do is click on that button and it's automatic, and then you're done! We are still in sherry country, and sun continues to shine. We've one rainy day but it didn't bother us, just read books and went for a walk. 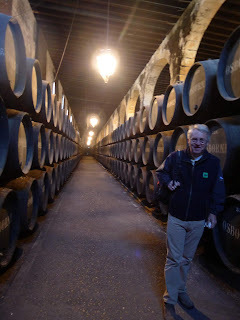 We've been onto Jerez for a bodega tour and lunch with new friends Barry and Mo (our current neighbours). Yesterday we took to ferry to Cadiz, a lovely town to wander around and, yes you guessed it, we had lunch in the sun!!! No, we don't get bored of it... Tomorrow we'll go into Sanlucca for more sherry tasting, the speciality being Manzanilla, Lawrence's favourite. The cycling around here is fabulous. Cycle tracks go in either direction along the waterfront and into town, so the bikes are really well used, and hopefully working off the sherry and seafood.